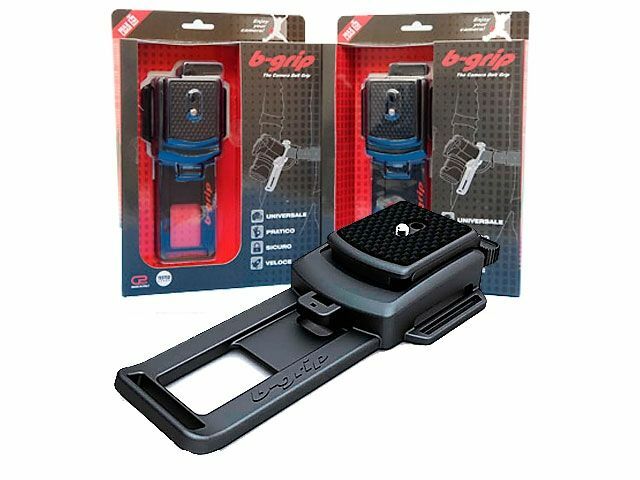 B-Grip provides a strong safe support for your DSLR. The base attaches to your waist belt ( or to the belt provided) , while the quick-release plate attaches to the camera tripod socket. A quick release mechanism provides instant access to the camera when required. A simple safety system prevents accidental release of the camera. An additional supplied safety cord can be deployed for extra peace of mind. B-Grip's broad base, spreads the weight of the camera making it extremely comfortable to wear. Unlike a conventional neck strap, the camera is held firmly in place and cannot swing about, reducing the chances of damage. 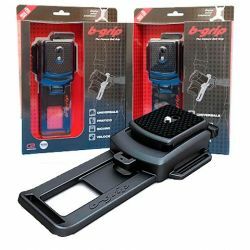 B-Grip lets you mount the camera both ways. Use it to provide a third hand when changing lenses. A supplied dust and rain cover provides additional protection if required. If you use a backpack when out walking, B-Grip can often be attached to the chest or waist straps. By spreading the weight across the shoulder straps, the camera is easier to carry for extended periods. It's also easier to see the rear LCD when reviewing images. When scrambling, the camera can't swing away from the body and risk damage. Most important of all, you can eliminate the tedious procedure of, removing the backpack, extracting the camera, taking the picture, replacing the camera, re-fitting the backpack. Now, with safe, instant access to your camera, you're free to take pictures as you walk, with no delay. Manufactured in Europe to exacting standards, B-Grip is constructed from high quality materials and will provide years of reliable service.